During our Amalfi Coast escapades, we were based in Positano (read all about my stay at Hotel Villa Franca) for three nights and took advantage of its perfect positioning along the coast line and booked a few trips out of town. Positano is the epitome of the Amalfi coast, picturesque, postcard perfect, actually lets update that with insta-worthy, so why would you want to leave? Well once you’ve soaked up the rays on the beach, tried all the gelato and walked many many many steps to admire the coastal views earning many memories of photography miles, a belly full of carbs and limoncello, it’s time to explore further. If you’re visiting in high season you will also experience the hordes of crowds that come for day trips, which is actually quite normal for any of the towns along the coast. Dr C and I are early risers so we are pretty much out and about at the crack of dawn. If you’re heading to Positano then here are my top picks of what you can do in the area by boat, ferry, car or public transport! Well when you’re in the vicinity it would be rude not to go and see how the other half live, after all Capri is home to the rich and famous and has many a beautiful villa to admire, especially the Versace residence, which can be spotted from the sea. Dr C and I took a private boat tour with Blue Star Positano for the day. The company office is located down on the beach at Positano in a little gazebo. Alternatively, everything can be booked online. We were met at 9 am by our captain Franceso, who was absolutely fantastic. Our itinerary, en route to the island of Capri included the following, Tiberios Jump, The natural arch, the white grotto, the grotto of wonders, Villa Malaparte, The Faraglioni Rocks, Marina Piccola, The Green Grotto, Punta Carena (Lighthouse of Capri), Blue Grotto and the Capri Man port, Marina Grande. Francesco also stopped the boat at areas of beautiful coral and sea life so we could get in the water to snorkel. All snorkelling gear is provided as are towels. Additionally the trip is made extra special with fruits, wine, Prosecco and limoncello of course to keep you well hydrated. Once on the island of Capri, which lies in the beautiful gulf of Naples, we had numerous options including having a fancy lunch in a hideaway restaurant but Dr C and I just wanted a relaxing day so Francesco dropped us off at the main marina and came to pick us up again in the late afternoon. It would be sacrilege to go all this way and not see Pompeii. It’s most definitely a day trip affair as the site is large with a lot of walking and exploring to be done if you intend on visiting it in detail. We booked via positano.com and were scheduled to incorporate a tour of Vesuvius and Herculaneum into the same day. A guide, who also doubles as a driver, provides the transportation to the point of interest and you are given plenty of free time to explore as you please. I would suggest getting to Pompeii quite early as it gets busy fast and if you want to take some great shots then it can be difficult with coach loads of tourists arriving by the hour. Make sure you take some comfortable walking shoes, trainers are totally advisable as Pompeii is an archaeological site with rough terrain. It is absolutely huge and never had I imagined the scale of this site until I arrived. Pompeii is a vast archaeological site near the coast of the Bay of Naples. Once a thriving and sophisticated Roman city, Pompeii was buried under meters of ash and pumice after the catastrophic eruption of Mount Vesuvius in 79 A.D. The preserved site features excavated ruins of streets and houses that visitors can freely explore. We made bookings online via positano.com however its worthy to note, that although the guide will provide you with all the history before alighting the private car, they do not accompany you and entrance fees are not included. Unfortunately, Mount Vesuvius was totally clouded over on the day we were supposed to visit. There had been fires in the gulf of Naples during our visit and visibility was very bad. Although it was our decision, we discussed with our guide if it was worth the hike up and in the end we mutually decided that there would be no point if all we could see was grey. However I did get some fantastic photos of Mount Vesuvius from far and also from our Junior suite at The Bellevue Syrene Hotel in Sorrento. As we were no longer going to Mount Vesuvius, our guide asked if we would like to visit a vineyard for some wine tasting and lunch and of course we were happy to oblige. Casa Setaro, was a small family run vineyard, which was located just at the base of Mount Vesuvius. Casa Setaro winery is run by Massimo Setaro, a 4th generation Setaro wine producer who grew up in Trecase, a small village clung to the Vesuvius lava slopes, just a few minutes from the historic city of Pompeii, facing the Gulf of Naples, Sorrento and the island of Capri. They strongly believe in the local grapes cultivated on the black terrains of Vesuvius. Since 79 A. D. many eruptions have generated fruitful and blessed soils rich in minerals, which give origin to wines with an extraordinary character. We started with a tour of the Vineyard with Loredana, who then led us through to the wine making area including the cellar and bottling area. The Vineyard is small and for now only has capacity to distribute wine nationally. Following the wine tour, we were seated for a three course lunch, which included sampling the different wines that the vineyard produces. Each went perfectly with a simple but tasty homely lunch served in the casa cantina of this family house. All wines can be purchased or shipped back home should you wish to extend your taste of the Casa Setaro experience. Visiting Casa Setaro was truly one of the highlights of my trip, as it was such a personal experience and friendly experience and I would thoroughly recommend it as a stop in your day if you’re in the area. Plus you also get to meet little Emma, the resident dog. My final recommendation would be an afternoon stop off at the old roman town of Herculaneum. 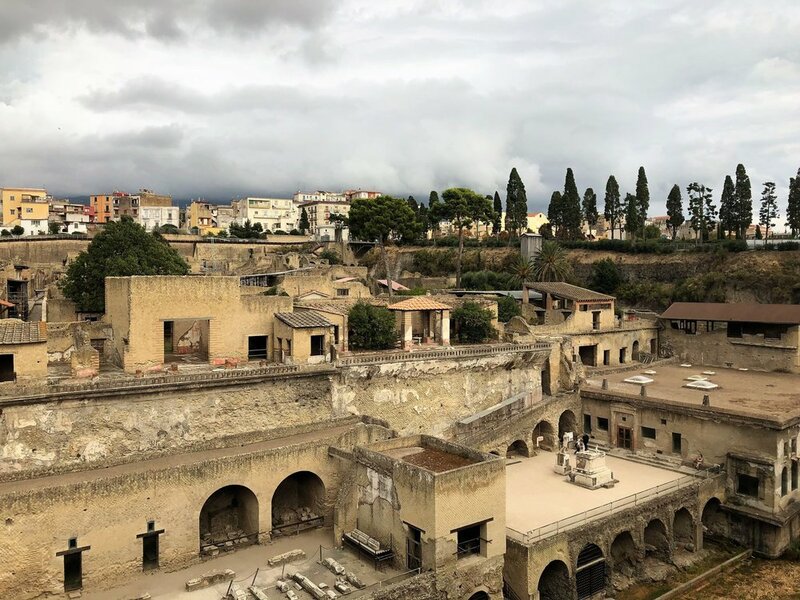 Located in the shadow of Mount Vesuvius, Herculaneum was an ancient Roman town destroyed by volcanic pyroclastic flows in 79 AD. It’s quite a spectacular site and also has a museum. We arrived mid afternoon and there were not many crowds, however I have to say out of all the sites I have visited Herculaneum is the most under-rated and less visited. This made it all the more intriguing for us to explore the excavation site and imagine what this town would have looked like in its former glory. Entrance fees apply here and audio guides can be obtained to help with the historical route around the site. Disclaimer: I was gifted the Don Vincenzo Riserva by Casa Setaro however all opinions, views and photography are my own and therefore remain a copyright of be-lavie. Have you tried any of the above day trips from Positano? Let me know which were your favourite below.